Car News Review: Ever Wonder How Brakes Stop Your Car? Ever Wonder How Brakes Stop Your Car? The braking system for present day automobiles has benefited from repeated improvements for well over 100 years. Disk brakes in front make up the standard braking system, while the back includes either drum or disk brakes. A network hoses and tubes connect the brakes, linking to the master cylinder from each wheel. The power brake booster, the anti-lock system and parking brakes also link into the braking system. Brake fluid jets through a network of hoses and tubes at each wheel when your foot contacts the brake pedal through a plunger located in the master cylinder. Brake fluid, which is a hydraulic, lacks compressibility and is akin to pushing a steel rod through a pipe. Fluid however, unlike a steel pipe allows for direction and therefore, it arrives with the same precise motion and intensity as its beginnings. It is imperative that the fluid consist of pure liquid without air bubbles. Air is compressible and creates a spongy feeling in the brake pedal while hindering the brakes effectiveness. At each wheel cylinder and caliper, you will find bleeder screws. The screws serve the purpose of bleeding the brake lines of compressed air. The two types of brake systems, disk and drum brakes, operate just a bit differently. The disk brake uses fluid from the master cylinder forcing the fluid in the caliper, pressing against a piston. This piston, then presses the brake pads snuggly with the disk rotor fixed to the wheel. This causes it to slow or come to a stop. The function compares to bicycle braking which involves two rubber pads pressing against the rim of the wheel applying friction to slow down and stop. Drum brakes on the other hand jets fluid into a wheel cylinder and in turn forces the brake shoes in an outward motion, applying pressure against the drum fixed to the wheel and bringing it to a stop. Whether it is the surface friction of pads or shoes on the drum brake, forward motion of the car creates heat. Heat supplies the driving force behind the friction surface of shoes and pad, wearing them out over time and demanding replacement. In modern automobiles, the disk brake has the best performance. From trains to airplanes, disk brakes are the preferred choice. Disk brakes simply last much longer, are less prone to disruption from water, can adjust independently, and can clean themselves. Disk brakes seldom grab or pull and are by far the superior system. Yet, you might wonder why we still use the drum brake system. The cost factor always plays a role in the production of an automobile. 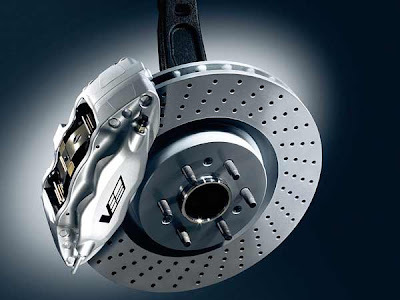 In the front of all vehicles in production, manufacturers make use of disk brakes. However on the back wheels, drum brakes represent a significant cost savings. The parking brakes presents as the main culprit. Drum brakes only require installation of a lever. However, on disk brakes, an entire mechanical system and sometimes a mechanical brake drum assembly requires attachment in the disk brake rotor. Parking brakes do not make use of hydraulics, but instead rely on mechanics.